Commentators question whether he was given prize too early, and "for what?" Former laureates describe win as "extraordinary" and "inspired"
Nobel awarded Obama for his "efforts to strengthen international diplomacy"
(CNN) -- The surprise decision to award U.S. President Barack Obama the Nobel Peace Prize elicited swift reaction Friday, with some hailing the choice and others expressing astonishment and skepticism. 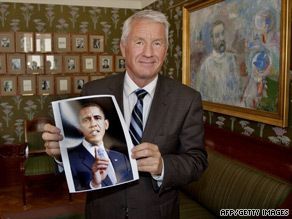 Chairman of the Nobel peace prize committee Thorbjoen Jagland holds a picture of the 2009 winner. Praise came from Afghanistan's president, the Israeli defense minister and even a senior official from Hamas, the Palestinian militant group that controls Gaza. Yet an Egyptian human rights activist said he was "shocked" that Obama won. And the Internet hummed with a range of views. Afghan President Hamid Karzai -- whose U.S.-backed government is locked in warfare with Islamic militants -- praised the choice. "We congratulate, wholeheartedly, President Obama on the award of this prestigious award," said Karzai, who commended Obama's "vision and leadership." Yet Hisham Qasim, Egyptian democracy and human rights activist, said he was "shocked" Obama won. "He has achieved nothing. He's stumbling. He hasn't achieved any of his promises and nothing is working. He promised to close Guantanamo and now that's not going to happen, and the Arab-Israeli conflict looks like it's going to get very nasty." Many questioned what Obama had accomplished to deserve the award. Gideon Rachman, a foreign affairs columnist for The Financial Times, wrote an online blog under the headline "What did Obama do to win the Nobel Peace Prize?" "While it is OK to give school children prizes for 'effort' -- my kids get them all the time -- I think international statesmen should probably be held to a higher standard," he wrote. Israeli Defense Minister Ehud Barak said he believes the prize "will strengthen President Barack Obama's capability to contribute to regional peace in the Middle East, and to an agreement between us and the Palestinians that will bring security, growth and prosperity to all the nations in the region." Hamas official Ahmed Yousef also congratulated Obama, "though it is early for him to be awarded this prize." Yousef noted that in a June 4 speech in Cairo, Obama "reached out to the Muslim world ... and said many of the right things." Obama, Yousef said, "is a man who thinks of achieving world peace"
Yousef said he believes Obama represents a "new era in American politics," but thinks "the president has done nothing to push forward peace between Israeli and Palestinians" even though the "intention is there ... it is an uphill battle with the Jewish lobby and Congress." "We know he is somebody different from past leaders who supported Israel economically and militarily," Yousef said. The Internet was alive with commentary from journalists, political leaders and others. The winner of 1983's Nobel Peace Prize, anti-communist Polish leader Lech Walesa, was quoted in The Wall Street Journal as expressing surprise. "Who, Obama? So fast? Too fast -- he hasn't had the time to do anything yet," the paper's Web site quoted Walesa as saying. One person expressed "sheer disbelief" that Obama had won, in a Twitter posting, saying the prize should have gone to a person such as Zimbabwe's Prime Minister Morgan Tsvangirai because "he stood up to a murderous dictator." Another person said she "seriously cannot believe they gave Obama the Nobel Peace Prize. Ridiculous." Others had praise. One person wrote: "My president Just won the Nobel peace prize!!!! Go prez Obama." Former Nobel peace laureates weighed in. Kofi Annan, the former U.N. secretary general who won the peace prize in 2001, called the choice "unexpected but inspired." "In an increasingly challenging and volatile world, President Obama has given a sense of hope and optimism to millions around the world" and "has shown that the only way forward is through genuine cooperation with other nations." Former Finnish President Martti Ahtisaari, last year's Peace Prize laureate, said it was clear the Nobel committee wanted to encourage Obama on the issues he has been discussing on the world stage. Wangari Muta Maathai, the Kenyan who won the 2004 Peace Prize, said Obama's win will help Africa move forward. Former U.S. President Jimmy Carter, the 2002 peace prize laureate, called the selection "a bold statement of international support for his vision and commitment to peace and harmony in international relations." He said the move reflects the "hope" the Obama administration represents across the globe. At the United Nations, Secretary-General Ban Ki-moon congratulated Obama, calling it "great news for President Obama, for the people of the United States and for the United Nations. "We are entering an era of renewed multilateralism, a new era where the challenges facing humankind demand global common cause and uncommon global effort," he said. "President Obama embodies the new spirit of dialogue and engagement on the world's biggest problems: climate change, nuclear disarmament and a wide range of peace and security challenges." CNN founder Ted Turner, who now heads the philanthropic United Nations Foundation he also started, offered congratulations. "We applaud his commitment to reengaging the international community and supporting global institutions, such as the United Nations," Turner said in a statement. "In less than one year, President Obama has elevated the importance of the United Nations and global cooperation in its policies."